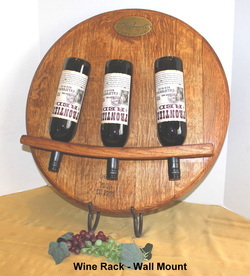 The Edna Valley Wine Rack is a three (3) bottle wine rack handcrafted from a wine barrel head and stave designed to be wall mounted. All mounting hardware is included. will fit in to a small space. 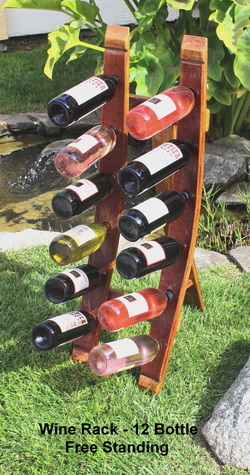 The Foxen Canyon Wine Rack is an eight (8) bottle table toop wine rack suitable for use on a table, buffet or shelf. designed to accommodate two (2) wine glasses when placed over a wine bottle neck.